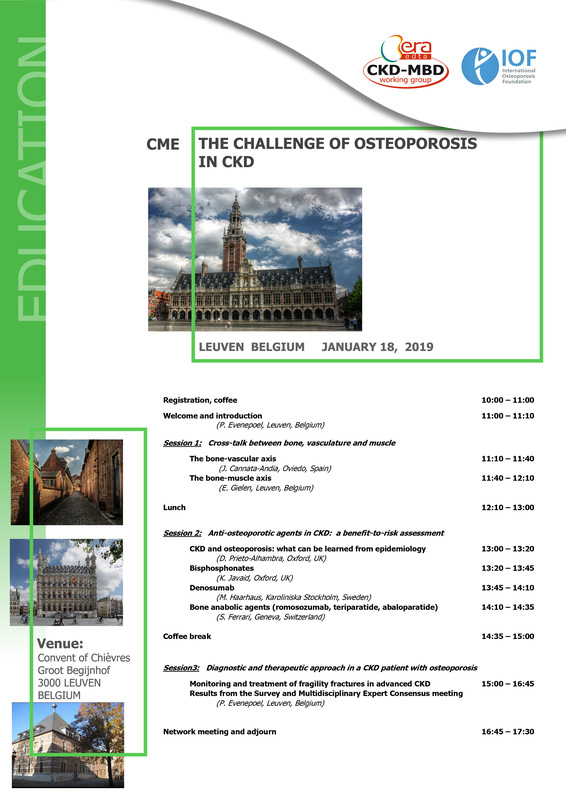 Join this educational event organised by EUROD, a CKD-MBD Working Group initiative, in collaboration with the International Osteoporosis Foundation (IOF) to be held on January 18, 2019 in Leuven (Belgium). Updates on the clinical assessment and treatment of osteoporosis in CKD anno 2019 will be presented through state of the art lectures given by key opinion leaders and the interactive voting system encouraging discussion. The ERA-EDTA Council recently approved the creation of a working group dedicated to Chronic Kidney Disease-Mineral and Bone Disorder (CKD-MBD). This acronym, or its translation, has been increasingly endorsed by different Nephrology Societies and International initiatives, including both the KDIGO (Kidney Disease Improving Global Outcomes) and the EBPG (European Best Practice Guidelines). 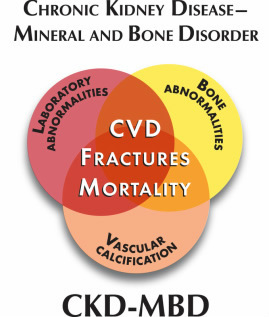 Abnormalities of calcium, phosphorus, parathyroid hormone (PTH), or vitamin D metabolism. Abnormalities in bone turnover, mineralization, volume, linear growth, or strenght. The term "renal osteodystrophy" is now limited to an alteration of bone morphology in patients with CKD, and it is one measure of the skeletal component of the systemic disorder of CKD-MBD that is quantifiable by histomorphometry of bone biopsy. Enhancing the scientific understanding and preclinical background. Promote education for Fellows and Faculty. Improve scientific communication and dissemination of knowledge in the field. To promote and organize pan-European independent research in the field of CKD-MBD including both basic, translational and clinical research. To improve and distribute knowledge in the field of CKD-MBD (appropriate therapies, Guidelines, etc.). To address particular research questions that have not and may not be addressed by usual means. To organize a structured educational process and program for young researchers in the field of CKD-MBD allowing them to start networking and exchange expertise. To collaborate to the organization of educational activities of the ERA-EDTA. To develop training concepts for both clinical as well as research activities throughout Europe. To organize an annual meeting focusing on educational themes and on research proposals. To organize an annual meeting during the annual ERA-EDTA Congress, to be included in the Scientific Program.